Cinematographer, documentary producer, director and administrator. Graduate of Tabor College and the University of Nebraska. Owner of Buller Films LLC. Executive director for the Family Life Network (Winnipeg, Manitoba); director of Third Way Media, formerly known as Mennonite Media (1999-2010). 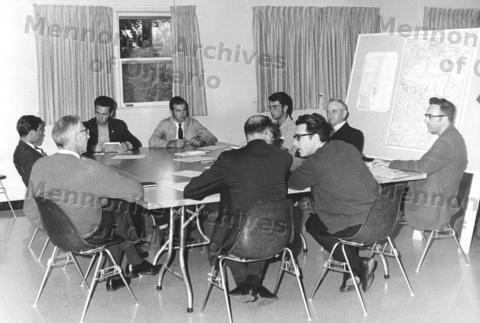 MDS-Salunga re building team for Roatan Is., Honduras in orientation at MCC headquarters, Sept. 24, 1969. Don Kraybill & Harold Stauffer were EM board admin. Names of other 7 men on the back. C.f. CM 17-31-3 re. Honduras.